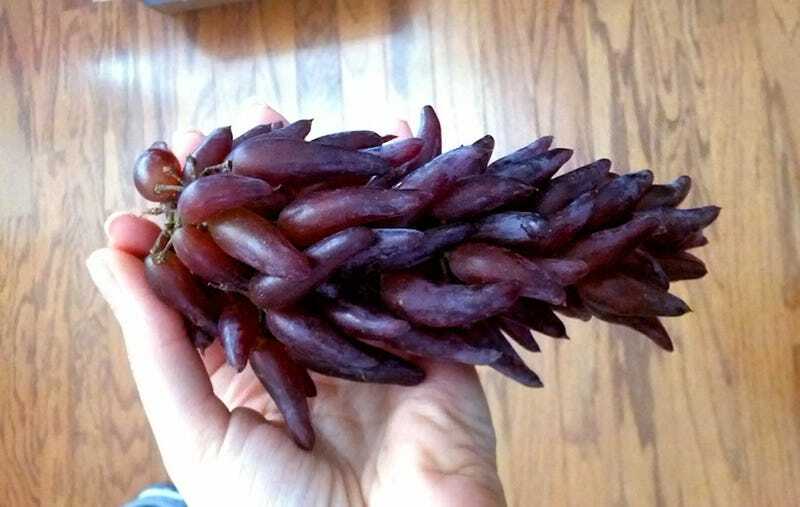 It looks a lot like a dark-purple ristra, but this bundle of elongated pods is in fact made up entirely of grapes. They're called "witches fingers," and of you're in the U.S. they could be coming to a grocery store near you, and with them a variety of other weird grapes. These grapes are called Witches fingers and are from the Californian breeding program International Fruit Genetics. Although it sounds like it could be GMO it's not, they are made through the hybridisation process of taking pollen from one plant and brushing it onto another plant. Ah, the wonders of cross-breeding (it's unclear, by the way, if Farmertmi meant to offer these words as a form of assurance, as if to say: "Don't worry, they're not GMO." As we've noted before, GMOs are not the enemy. And if unexpected side-effects are your concern, remember that conventional breeding techniques like cross-breeding have been producing weird and dangerous results for years. /soapbox). Anyway, according to Farmertmi, designer grapes are kind of a thing these days. There are quite a number of these varieties now, in different colours as well. Whats really interesting is that IFG also have a few other unusual varieties such as 'cotton candy' which when ripe acquires the taste of cotton candy - it's very unusual but also delicious. You guys in the US should see the variety on the shelves in the next few weeks actually. Things you now know that you probably didn't when you woke up: cotton candy grapes are a thing, and "grape technologist" is a real job.